Back in December, 2013, I won a half plate, British-made Kodak Specialist, a lovely old studio camera, at auction. I was quite smitten by it but, apart from a few paper negs to test the bellows, it never burned any film. I had a stack of double dark slides in the half plate size for it but I think only Ilford in their once a year custom large format film run would be able to supply it with material. That meant it would have been necessary to buy 5x7 film and trim it to fit. With one thing and another - including the fact that it's a big, heavy beast - I never actually took it outside at all. Early this year, when I was considering a deal for the Leica outfit I've been writing about in The Leica Diaries, the chap who had the outfit wanted to include the big Kodak as part of the deal. Since I wasn't using it, I reluctantly parted with it. 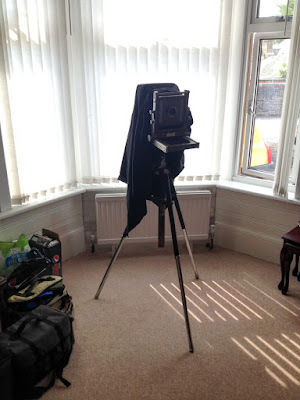 Then a few weeks ago, a Kodak Specialist owner stumbled upon my blog whist looking for information about his camera. He got in touch to say he was hoping to find a good home for it. Well, I couldn't resist and ended up buying the outfit myself. And that's why I once again have a relatively huge, very capable and, in a 1950s utilitarian way, quite beautiful half plate view camera. This time round the big Kodak has come with a 203mm f7.7 Kodak Ektar lens, the standard optic for the camera, and a 90mm f6.8 Schneider Angulon. The Ektar has an excellent reputation and makes a great lens for 5x4 as well. The Angulon barely covers the 5x4 format but its presence was explained by the inclusion of a quarter plate back in the bespoke Kodak Specialist outfit box. The outfit also included a nice, original lens hood for the Ektar and a green filter that drops into a special holder but the filter has seen better days. 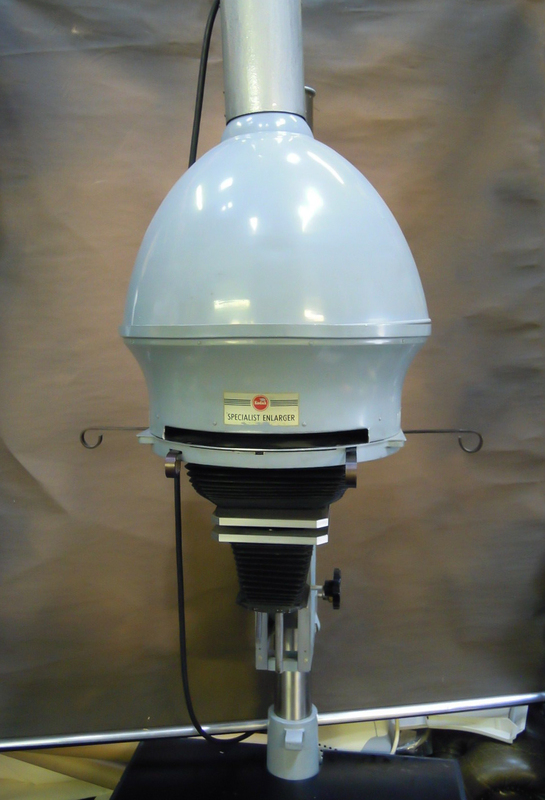 The filter size is known as Mount 370. I went on to Ebay to see if there was anything available and found a lovely Kodak yellow filter for less than a fiver including postage. That's now sitting in the Kodak outfit case as well. If anyone has Mount 370 accessories they no longer need then please get in touch. The big question, I suppose, is will I actually get round to using it this time? Definitely! I'm determined to load it into the boot of the car and do some "proper photography"' as I like to think of large format. That would come, I suspect, as a welcome change to reader Michael Carberry who fears that I go on about Leicas so much there's a danger I'll turn into "one of them". One can only speculate what that would entail but I certainly don't like the sound of it! Neither do I want the blog to morph into a Leica-only website so a bit of variety would do us all some good. The first thing I'll have to do is knock up a jig of some sort for trimming 5x7 film to half plate size. Then I'll need to buy some film. The Foma 5x7 is quite reasonably priced but I'm also going to check out X-ray material. Andrew Sanderson has successfully used this in the past although I believe most of it is orthochromatic. 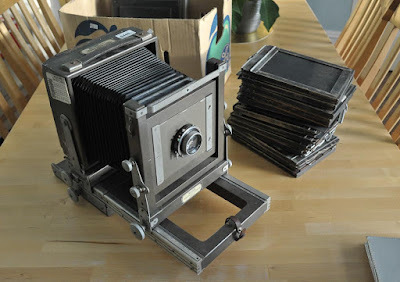 When I had my first Kodak Specialist, a reader whose name escapes me made the offer of some 5x7 X-ray film so that I could try the camera out to make sure everything was working properly. If the offer is still available then I'd like to take him up on it. I wouldn't mind getting a few 5x7 DDS holders as well so if you can help, again, please get in touch. My intention is to contact print the half plate negs onto 10x8 paper or onto 5x7 paper and then mat them. Mind you, the odd Kodak Specialist half plate enlarger (left) pops up on Ebay from time-to-time. It depends on how much darkroom space I'm likely to have at the new home we eventually end up in. That's an unknown quantity at the moment so I'm just concentrating on contacts. I've never tried doing 5x4 contacts although some people say they can be magical. Being that bit bigger, I reckon half plate would be just about perfect on 10x8 paper and can't wait to see what they're like. Bruce, bar some specialist stuff, I believe all X-Ray film is mostly ortho. Though you can get "blue" and "green" sensitive film. That refers to the particular holders and the colour of the phosphors in them that glow when exposed to X-Rays. BTW the eBay chap in Tennessee seems the cheapest - just over £20 plus postage for 100 sheets of his Agfa G-Plus. . . Boy the Specialist Enlarger is a right large piece of work. Looks like fun. David Kirk, do you have a link for the chap in Tennessee you mentioned? Thanks. The nice thing about x-ray film is you can handle it under a safelight and see what you're doing if you need to trim it to size or develop by inspection. Bruce, if you ever want to use normal filters on the Ektar you can cobble an adapter from a 37mm push on adapter (mine was for Series filters) glued to a suitable step-up ring. I did this, and now I can use my existing folters, including Lee grads etc (for colour slide film). Funny coincidence, when I first read about your Kodak Specialist back in December 2013 I stumbled upon one on eBay that I bought for myself. Like yours it sat unused for a very long time, mostly because it didn't have a lens or lens board. Unlike you I never sold mine though (but I did try). This weekend I actually got to use it for the first time. A friend of mine and myself held a small workshop for some of his friends on darkroom printing in a studio I'm renting, in connection to this I got to borrow an old projection lens from my friend. I fashioned a lens board from cardboard and lots of lots of tape, set up some lights and shot paper negatives the entire weekend, great fun! I'm thinking about making this setup a little more permanent however, but I'm not quite sure where to find a lens board, any ideas? The general advice for all LF accessories is to look on eBay. It's relatively easy to make a lensboard. Almost any material will do. Plywood, MDF or aluminium are all practical, depending on your level of skill. You'll need proper woodworking skills to make one up from three pieces of polished mahogany, tongued and grooved together. There may be light-traps that you'll need to contrive. Obviously, you can measure the camera for the outside dimensions and thickness, but you'll need to have the proposed lens in your hands to decide how to fit it. Old brass lenses commonly have a flange with small screw holes to fix it directly to the board. Easy! More modern lenses with shutters are made in three parts – front element group, rear element group and the shutter itself. The front and back parts screw into the shutter. There will be, or should be, a ring that screws onto the rear of the shutter to fix it to the lens board. For this, the hole needs to be a particular size, depending on the shutter. If you want the camera as a curio, you'll want a picturesque brass lens, but if you want to take pictures, a more modern one will be better. Check that the shutter works before you buy or be prepared for giving it a service. Before choosing, look up the sorts of focal lengths that will cover the format you're using. 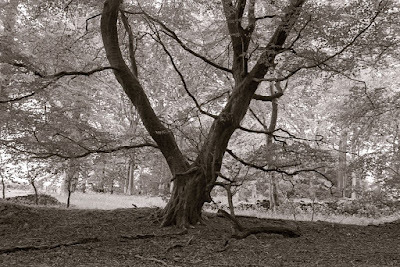 The relationship between focal length and coverage is not obvious in large format photography. And don't forget. The purpose of all this is enjoyment. So enjoy!